Korg’s Gadget is now well-established as one of the best iOS DAWs, and version 2 sees improvements being made not only to this mobile version, but to the Mac one, too. And, for the first time, Windows users can get a taste of the Gadget goodness, although they don't have access to the full product. Confused? Read on and we'll explain. First the straightforward bit: there are six new Gadgets in version 2, four of which are available now, with details of the remaining two still to come. Memphis is a semi-modular analogue synth; Pompei is a 6-voice analogue synth; Taipei is a MIDI Out Control device, suggesting that Korg is looking to open Gadget up as as hub to control your other gear; and Durban is a bass effect processor. On iOS, the Gadgets are available as paid in-app purchases - the version 2 update itself is free - but on the Mac, you have to pay for the version 2 update ($100) but the new Gadgets come included. Got that? The full version of Gadget 2 for Mac retails for $299, but is currently on sale at $199. If you're new to Gadget on iOS, you can currently grab it for the release sale price of $19.99/£19.99 on the Apple App Store. Now for the slightly complicated bit: as well as this update to the full-on Gadget, Korg has also confirmed the release of the Korg Gadget 2 Plugins bundle, which is available for both Mac and PC. 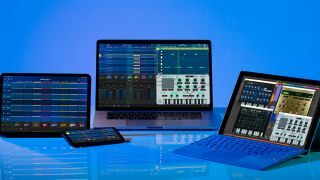 This enables those who just want the Gadgets to buy them on their own so that they can be used in any DAW. The regular price is $199, but you can currently purchase the bundle for $149. Hopefully that's cleared everything up, but you can find out more on the Korg website.